A team of Michigan State University scientists has discovered that pandas are more sociable than previously thought, and like to spend time together for weeks at a time. The study involved GPS collars tracking the furry friends. Five pandas participated in the study: three female adults named Pan Pan, Mei Mei, and Zhong Zhong, a young female Long Long, and a male named Chuan Chuan. They were captured, collared, and tracked from 2010-2012, in the Wolong Nature Reserve in southwest China. The biggest surprise scientists received was that pandas seemed to like hanging out together quite often. Three pandas in the group spent some time together in the same part of the forest a few weeks in a row. “We can see it clearly wasn't just a fluke, we could see they were in the same locations, which we never would have expected for that length of time and at that time of year,” Vanessa Hull, a research associate at MSU's Center for Systems Integration and Sustainability (CSIS), said in a statement issued by the university. 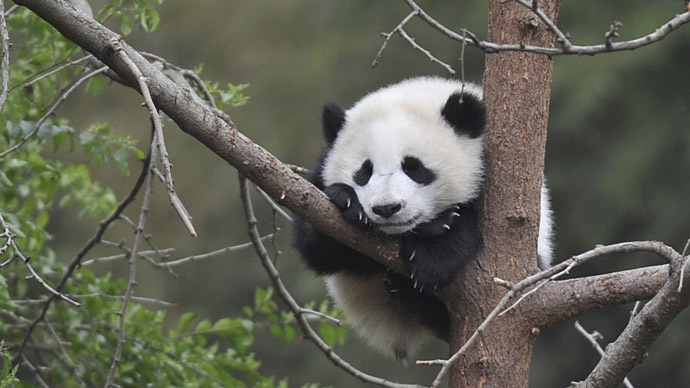 “'This might be evidence that pandas are not as solitary as once widely believed,” she added. The scientists also discovered previously unknown eating habits among pandas. The mammals are known to seek out bamboo, which makes up the majority of their diet. However, researchers discovered that pandas returned to the same spot after a long time period – for instance, half a year – which brought about the conclusion that they remember good dining experiences. “They pretty much sit down and eat their way out of an area, but then need to move on to the next place,” Hull said. The Chinese government has been banning the use of GPS collars on pandas, which are endangered and under state protection. This is one of the first panda studies involving the technology. A previous survey, carried out by China between 1998 and 2002, said there were some 1,596 pandas in the wild.